NEW! Gift CertificatesThere are 7 products. Gift Certificates are trully a beautiful gift for your friends, family members and all beloved ones in times when you are actually running out of time and you do not know what exact gift you should give them. Gift certificates help you not only saev your precious time, but also allow your beloved ones to pick exactly those handmade gifts from Unikatnica they want to have. 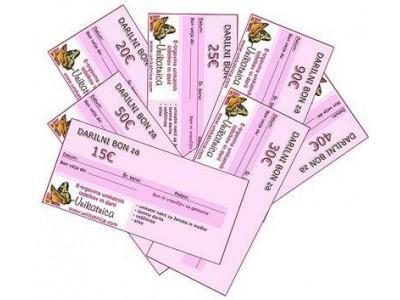 You can choose between gift certificates in value of 15€, 20€, 25€, 30€, 40€, 50€ and 90€. IMPORTANT! You need to register/prijaviti to e-store Unikatnica. Gift certificates in value of 90€ from e-store Unikatnica are trully an amazing idea in days when important anniversaries and holidays are approaching fastly and you are running out of your time to buy original and homemade gifts. IMPORTANT! You need to register/prijaviti to e-store Unikatnica. Gift certificates in value of 50€ from e-store Unikatnica are trully an amazing idea in days when important anniversaries and holidays are approaching fastly and you are running out of your time to buy original and homemade gifts. IMPORTANT! You need to register/prijaviti to e-store Unikatnica. Gift certificates in value of 40€ from e-store Unikatnica are trully an amazing idea in days when important anniversaries and holidays are approaching fastly and you are running out of your time to buy original and homemade gifts. IMPORTANT! You need to register/prijaviti to e-store Unikatnica. Gift certificates in value of 30€ from e-store Unikatnica are trully an amazing idea in days when important anniversaries and holidays are approaching fastly and you are running out of your time to buy original and homemade gifts. IMPORTANT! You need to register/prijaviti to e-store Unikatnica. Gift certificates in value of 25€ from e-store Unikatnica are trully an amazing idea in days when important anniversaries and holidays are approaching fastly and you are running out of your time to buy original and homemade gifts. IMPORTANT! You need to register/prijaviti to e-store Unikatnica. Gift certificates in value of 20€ from e-store Unikatnica are trully an amazing idea in days when important anniversaries and holidays are approaching fastly and you are running out of your time to buy original and homemade gifts. IMPORTANT! You need to register/prijaviti to e-store Unikatnica. Gift certificates in value of 15€ from e-store Unikatnica are trully an amazing idea in days when important anniversaries and holidays are approaching fastly and you are running out of your time to buy original and homemade gifts.